Whenever I tell people that the best way to stop bullying is to be compassionate, people tell me I’ve lost my mind. Bullies are mean obnoxious people. It is very hard to feel compassion for someone who is being mean to you. They don’t deserve your kindness. They should have compassion for you. I’ve heard all the excuses in the world for why people won’t be compassionate to the people around them. The question I have for them is this: has your lack of compassion helped you to solve your problem? No? I’m not surprised. It’s probably helped you to feel righteous anger. That anger has helped protect your ego. But it hasn’t helped you make the other person stop. Men in particular will tell me that the only way to get a bully to stop is to punch him. My response is this: just because you were never taught how to stop a bully using non-violent means doesn’t mean it’s not possible to do. And I would argue, if things escalated to violence, it means the adults around you failed you. They failed to teach you how to get a bully to stop using words. People who are able to use their words to stop a bully in their tracks are powerful people. The people who can do this – are compassionate. They don’t fight. They just allow the bully to defeat themselves. 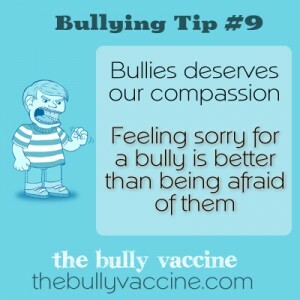 Compassion helps you do this because it helps you moderate your emotional response to the taunts of a bully while the bullying is still in the verbal stage. When you respond calmly and compassionately, the bully isn’t getting the reward they want, which is to see you upset. The fact they can’t scare you or upset you means they are a failure as a bully. They will eventually go find someone else to taunt. This is why some people are bullied and others aren’t. The mistake people make when they consider compassion is they think they are doing something nice for the bully. That’s not what you are doing at all. You are feeling compassion so that you don’t feel scared or angry. The best response to a bully is to not be bothered by them or upset by them. Anger and frustration is what the bully wants you to feel. You defeat them by NOT getting angry or upset. There is a reason every major religion and philosophy teaches compassion. It’s a powerful tool for managing interpersonal dynamics. Use it. It won’t make you weak. It will make you strong. Learn more about this on this website. Sign up for my newsletter, check out the free videos on the website.